On every sixth of Lunar Month the famous and highly inspiring programmes of Fateha Chhatti Sharif is celebrated within Ahata-e-Noor in front of Begami Dalan. Those who attend this function realise its solemnity and sanctity and also the benefit which they receive. This program which has its own blessings starts from about 8.30 A.M. in the morning and continues about an hour without any programme of Qawwali The programme beings with recitation of Quran proceeded with recitation of Shijra (spiritual genealogy of Khwaja Saheb) and then with 'SALAM' and ends with Fateha. In the evening in every home of the Khadims this Fateha is organised and prayers are offered for the well being of the devotees. This is to inform you that on every 6th of lunar month the Niyaz of Hazrat Khwaja Syed Moinuddin Chishty (R.A.) "Gharib Nawaz" is being held. 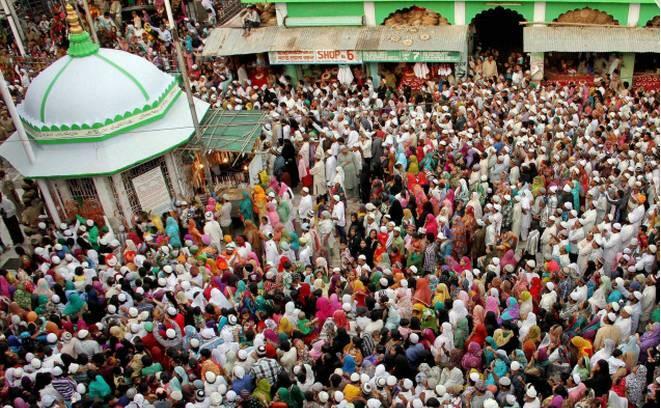 First thing in the morning at around 9:00 am were thousands of devotees of khwaja baba. (R.A.) gathers together & represent themselves towards Dargah Sharif & pay there respect & Pray the Salaat-O-Salaam & After Darood -0-Salam the food is served to all over Dargah Sharif of Kwaja Baba which is in form of Niyaz & Langar; Niaz & Langer is taken part from those people who are the members & according to their capacity they intend to take part every month. We are based here in ajmer where you can send your Niaz, Langer, Quran khani, Yashin Khatam of 41x, Sawa Lakh Darood Sharif, Sawa Lakh Ayate- Karim, Sawa lakh Bismillah Sharif, Sawalakh Nade Ali, prayers for members who passed away (died) etc. This is mainly for people are working don’t have time to pray.All this prayers would help to benefit spiritually, if you have any problems, any diseases, any dangers, any troubles, etc. these prayers would really help, with good faith. (Ameen).